Great Wolf Lodge, Kansas City: Great Location, Great Fun! Home » Blog » Family Vacation Destinations » Midwest Destinations » Great Wolf Lodge, Kansas City: Great Location, Great Fun! A destination unto itself, the Great Wolf Lodge seems to have become a part of this family’s regular vacation destination considerations, much like Disneyland. Our first taste of the Great Wolf was in Grapevine, Texas last fall. It was only one night, but we knew then we’d be returning again and again to as many of their 10 locations nationwide (plus one in Canada) as we could. Our daughter, Reagan never fails to remind us how much she can’t wait to go back to the Great Wolf Lodge. This summer we traveled to Kansas City and spent two nights at the Great Wolf Lodge on the Kansas side of the border. We were just 25 minutes from downtown and right across the street from Legends Outlets, which gave us plenty of restaurant options and great shopping. Thrill seekers will love that the Kansas City Great Wolf is also just five minutes away from the amazing Schlitterbahn Water Park. While the Great Wolf Lodge has its’ own indoor water park, if you’re one of those people who just can’t get enough water slides and wave pools (raising hand), then you’ll want to do both. My advice? Do the water park at the Great Wolf first and work your way up to the even more thrilling slides at Schlitterbahn. 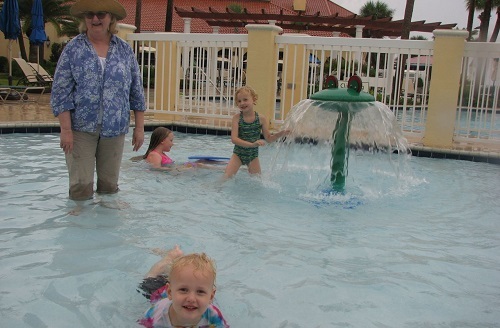 Both water parks have something for everyone though, including your little ones. What else makes the Great Wolf Lodge, Kansas City so great? Some entertainment options may vary at each of the 11 Great Wolf Lodge locations, but, what you can always count on is exciting water park fun and a MagiQuest® adventure! What Reagan loves most about the Great Wolf Lodge is waking up every day to fun and excitement starting in her very own room. What we love most is the great care and attention given to providing our family a memorable, first-class vacation for everyone without ever having to leave the property. It truly is a great escape! Photo credit: Water park photos courtesy of Great Wolf Lodge.